To determine whether you have a leak, confirm that no water is being used and remove the meter lid. Take a reading from the meter, wait 1-2 hours and read the meter again. If the reading has changed, you probably have a leak. Most meters have a small triangle in the center of the meter. If this triangle is moving, there may be a leak. If there is an indication of a leak, you can isolate its location by turning off the water at the valve where your water service enters the house. After turning off the valve, once again read the meter and wait approximately one hour. If the reading has changed, the leak is in the service line between the meter and the turn off valve in the house. If the reading has not changed, the leak is in the house. Check your toilets, humidifiers, and faucets. Toilets are the single BIGGEST water consumer in the household accounting for 40-45% of water usage. Leaks in toilets can DOUBLE or TRIPLE overall water consumption each month if gone undetected. 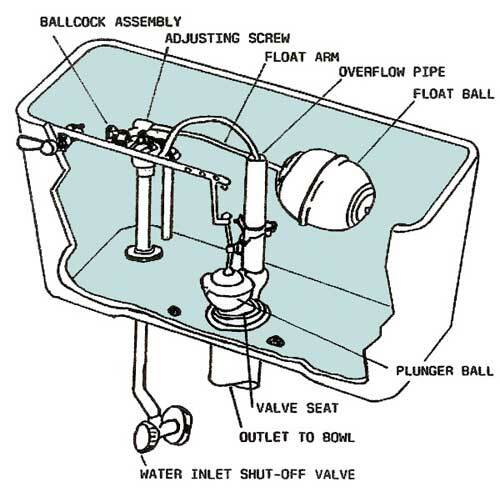 Toilet leaks usually occur in toilet tanks where water drains down the overflow or past the plunger ball. Toilet leaks can be detected easily by adding food coloring to the toilet tank. If the coloring enters the bowl within 30 minutes, you have water loss through the toilet. Make the necessary repairs ASAP.